For those with limited gardening spaces, container gardens are excellent alternatives to grow your favorite vegetables. Maximize this space by using hanging baskets in conjunction with regular planters on the ground. Many vegetables and herbs grow well in hanging baskets, including cucumbers. Dwarf varieties with smaller fruits thrive even in the limited space of the basket. The vines and fruit trail over the edges of the hanging planter and require no staking for support. Fill a hanging planter that is at least 12 inches in diameter and 10 inches deep with a quality potting mix to within 1 inch of the rim. Mix a slow-release, balanced fertilizer into the soil just prior to planting. Follow the fertilizer label instructions for the exact application amounts. Sow five cucumber seeds in the center of the pot to a depth of ½ of an inch. Hang the planter in an area that receives full sunlight, or at least eight hours of sun a day. Water the planter from the top after you hang it until the excess moisture drains from the bottom drainage holes. Water only after it is hung, otherwise the wet soil may be too heavy to lift. Keep the soil moist at all times. Check the soil surface daily and water when it feels dry. 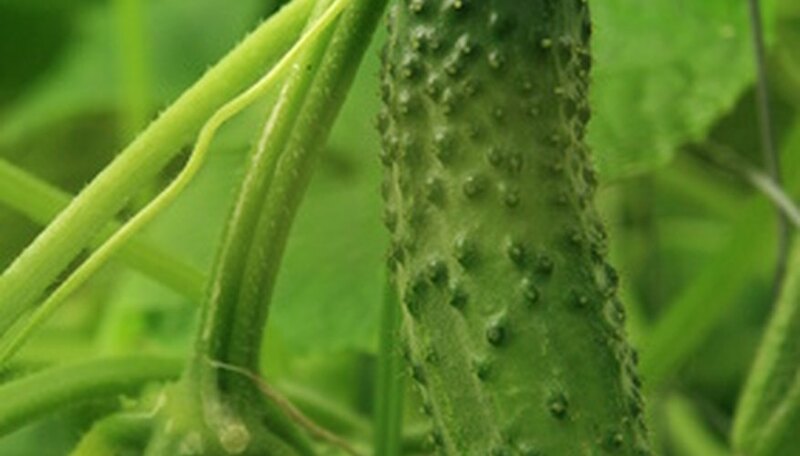 The cucumber seeds usually germinate within seven to 10 days. Thin the seedlings to the two largest within two to three days after germination. Cut the smaller plants off at the soil surface with a pair of small scissors. Thin a second time to the strongest plant once the cucumber seedlings reach about 8 inches tall. Water daily as needed to keep the soil moist but not soggy. Begin fertilizing in July once weekly with a with a balanced, soluble fertilizer instead of the normal daily watering. Follow the label instructions for fertilizer amount. Harvest the cucumbers as soon as they reach their mature size. This encourages further fruit set and helps avoid unnecessary weight in the pot. Dwarf tomatoes varieties that are suitable for hanging baskets include summer dance and patio pickle. Many of the small Japanese and pickling varieties also do well. Cucumbers are not frost tolerant, so plant them after all danger of frost passes in spring. Hanging baskets dry out more quickly than regular ground planters. Water as soon as the soil feels dry, usually once daily, but they may require twice daily irrigation during the hottest part of summer.